This article presents an example of how to add a Web Action to the Work Item Editor Toolbar based on the wiki article Work Item Web UI Internal Customizations: Actions and Policies. The particular use case described shows how to automate the creation of a linked draft Defect Work Item at just the click of a button. Linking Work Items allows users to express the inherent relationships of the artifacts representing work performed in the different stages of a development effort. 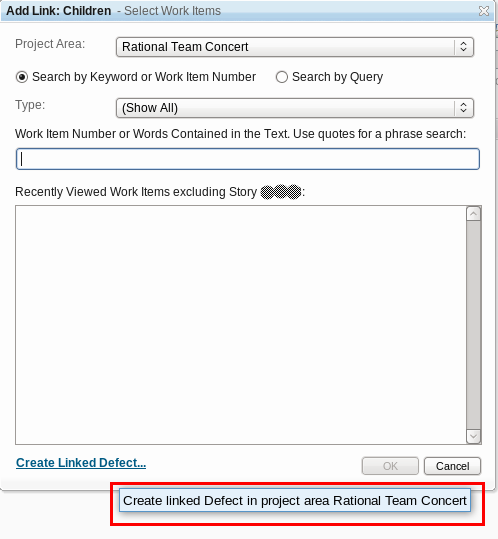 The IBM Rational Team Concert link wizard provides the user with filtering and searching capabilities to locate the Work Item the user wants to link to. In addition, a feature in the wizard allows the option to create a new draft Work Item that is already linked. The link type to be used is the one chosen and the Work Item type that will be created is the fist that appears under the Work Item Web menu. The first step in this customization process is to build the infrastructure so as to provide the custom Web Action with the described capability. We have to create an Eclipse Plug-in project and define an extension of com.ibm.team.workitem.web.editorToolbarAction. 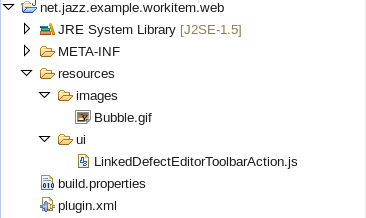 For our sample code, the Plugin id defined is net.jazz.example.workitem.web. For this reason, we will need to specify the extension details directly in the plugin.xml file, using the plugin.xml tab of the Plug-in Manifest Editor (for further information about the meaning and syntax of the different attributes and their possible values, review References). The net.jazz.ajax.webBundles has to be added to mark the plug-in as a web component. It is also important to note that the action declaration defines the dojo resource that will implement our action, and the module declaration is rooted by the eclipse Plug-in ID. The folder structure and needed files are to be placed under a resources folder in our plug-in project. What we have done so far is enough to add a new Work Item Editor Toolbar Action. In the rest of the article we will review some of RTC internals to complete the article’s automation example. Now that we have the structure in place, how does the linked Defect feature we want to automate work? When we click on the Create linked Defect option from the link wizard, a new draft Work Item is generated in the web client. This is achieved by the generation of a url for a draft Work Item with parameters that determine, among other things, that this resource is linked, the link type and the associated Work Item. 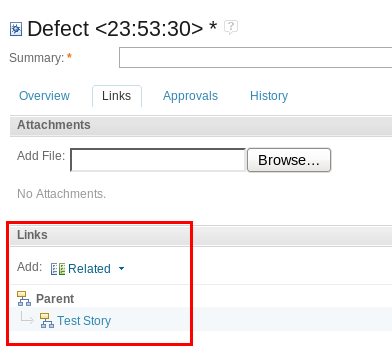 Clicking on our new action will generate a draft Defect which parent is our Story Work Item. That’s it! We have showed how to provision a new Work Item Editor Toolbar Action to RTC and we have also explored one of the internal behaviors of the Web client as an example automation for a toolbar item.